I have finished the main subject of my oversized bench cover. I am now moving on to the background and then the side border. I had planned a very dark chocolate for the background, but now I am worried that I will lose the sheep to the brown. I also dyed an oatmeal which is just a tad bit brighter than the linen background. I don't care for light backgrounds, but that may end up the case with this piece. I am going ahead with the dark background to see if it will work or not. If not, oatmeal it is. I decided to try something different with Jonathan. I went to Texas Art Supply and purchased stretcher bars one inch bigger than the finished rug. 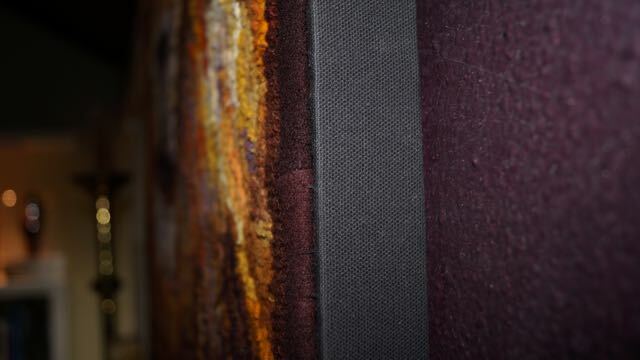 I put the stretcher bars together and stretched black duck twill canvas over the frame, stapling it to the back. Then I sewed the rug onto the duck, stretching it tight to the edge as I sewed the binding to the duck fabric. I love it because it is stretched tight and flat and looks just like a painting hanging in my living room. Jesus of Nazareth 2015. 43" x 39". #6 cut on linen. Designed, dyed and hooked by April D. DeConick. Red Jack Rugs 8-value Packs used include 159: Briar Rose, 142: Sea Shells, 120: Black Cherry, 146: Black Orchid, 124: Rose of Sharon, 148: Tanglewood, 114: Faune Brown, 118: Silver Birch, 151: Fruited Raisin, 135: Crab Apple, 112: Rowan Raspberry, 134: Pink Iris, 117: Wilde Wood, 119: Hubbard Fig. My rug, Jesus of Nazareth, was inspired by the famous crucifixion scene in the 1977 film where Jesus, portrayed by Robert Powell, suffers the crown of thorns. I was deeply affected by this movie as a young woman, and this image of Jesus will always be Jesus to me. 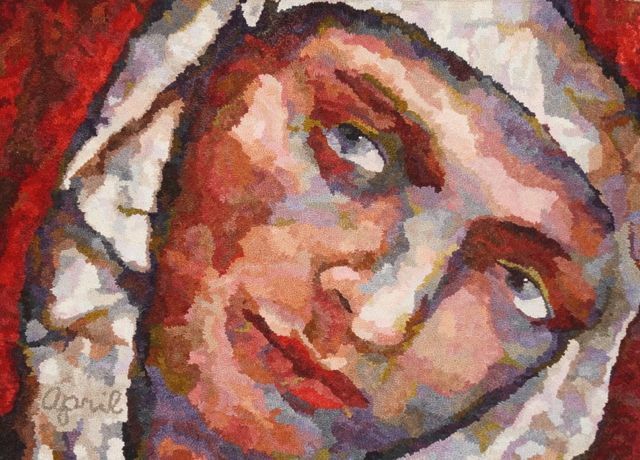 I choose this portrait to compliment the rug Mary Magdalene that I hooked two years ago. It will hang on the wall of my office next to Mary. This rug is different because it is an inch mat. 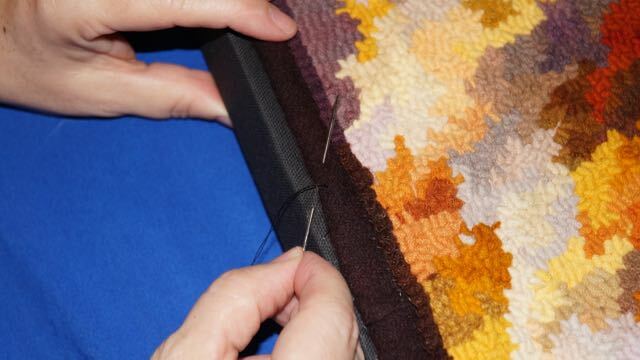 I wanted to hook the most traditional rug possible, while breaking open its form so that something new happened with the inch mat. Using a pixelated map I created as my guide, I hooked each inch by its value (the lightest or darkness of the color) with no regard for the color. Each inch square, in fact, contains at least two different colors in the same value. 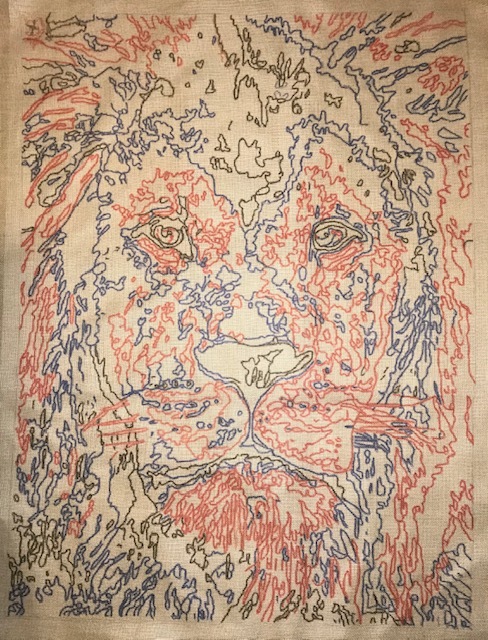 My goal was to create a rug that ought to be viewed in person, because where you stand in proximity to the rug makes a difference in terms of what you actually see. The closer you get to the rug, the more you see squares of color. The farther away you stand from the rug (the broader view you have) the clearer your focus becomes, and you are able to see Jesus' face. There is a lesson here for me as a professor of early Christianity, that standing at a distance brings Jesus into better focus. I used a large number of colors in this rug, including 8-values of each: 159: Briar Rose, 142: Sea Shells, 120: Black Cherry, 146: Black Orchid, 124: Rose of Sharon, 148: Tanglewood, 114: Faune Brown, 118: Silver Birch, 151: Fruited Raisin, 135: Crab Apple, 112: Rowan Raspberry, 134: Pink Iris, 119: Hubbard Fig, 117: Wilde Wood. The stats. In total there are 1677 squares of 14 colors in 112 values. Phew...I am almost done with this big inch mat. It is going to be 45" by 43" when finished, which means that I will have hooked 1935 squares. As I have been viewing it along the way, I have determined that you need to stand back about 20 feet to really see the image, or look at it through a camera lens or quilters reducing glass. I have added a few more colors as I have advanced, mainly because I ran out of what I was using and only had certain other colors already dyed. 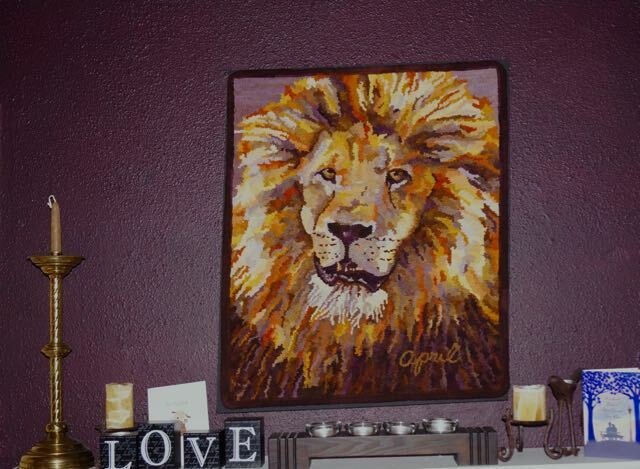 Will record the colors on the last post about the rug. I haven't vanished off the face of the earth, although sometimes I feel like it. Being chair of a university department has taken more time than previously when I was faculty only. I have been working on the inch mat and have about 400 squares left to hook. I am bored out of my mind with it, but maybe I needed that this year with my mind so occupied with work. 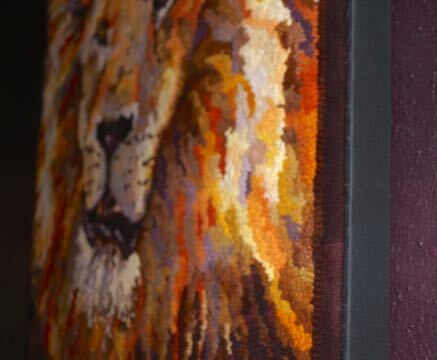 The biggest rug hooking news is that Satu made it into the 2015 Celebration of Hand Hooked Rugs. So watch for him when that issue comes out in August. Also I am going to be teaching my Wool Snapshots Workshop at Sauder Village in August, and then in September the Witch Workshop in San Antonio for ATHA Biennial. This means that I can't dye in canning jars anymore. So I got serious. This winter when our shower needed repair, I had a sink installed in my garage. A couple of months ago, I bought 8 turkey roasters so that I can dye yards at a time. I need to start dyeing very soon to get everything done in time, but at least things are set up and ready to go. I also decided that my packaging needed a facelift, literally. So I have a new logo now, which I really like. There is nothing much to say except that I continue on toward my 2000 square goal. Here is the top 300 squares. Nothing to look at yet except color. I am finding this a very calming project since it is just focused on hooking values into one inch square blocks. There are not mistakes or reverse hooking here. The overall piece is going to 43" by 47". So here is a photo of the first 100 square inches. It is the top left corner. Take a guess. If you aren't sure, there will be plenty more opportunities since I will post every 100 square inches to show the progress. Time involved so far? About 3 hours to create my visual and about 2 hours to get the backing ready to go with the inches drawn out and serging around the edges. Then about 5 hours into hooking and another 2 hours into cutting. Total labor so far: 12 hours. 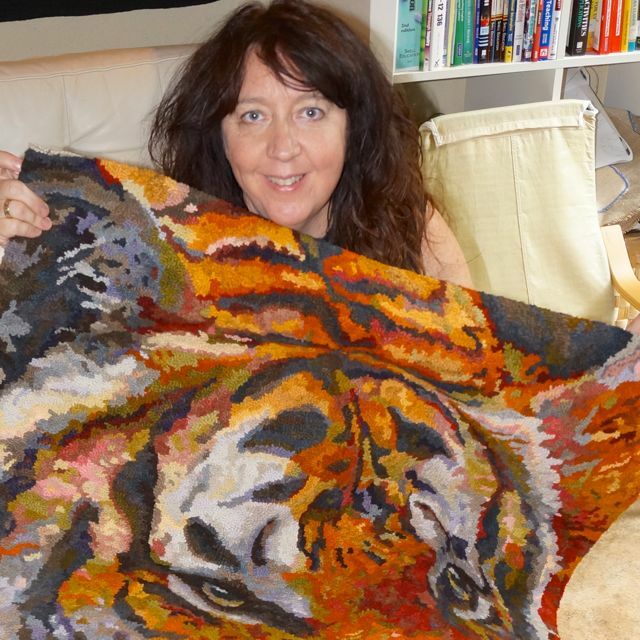 I have hooked another 15 hours into my big mat of Satu the tiger from the Houston Zoo. I am almost halfway finished. I have done very little reverse hooking on this piece. It looks small in these pictures, but it is huge, 36" by 40". I wasn't sure that I would like the amount of green and pink that I am adding alongside the oranges and maroons. But I think the combination is stunning. I am looking forward to moving down into the neck area and adding the cooler tones to balance the piece. News on the website...you might notice that it looks different. I have completely recreated the Red Jack Rugs website and have a subscribe button to the right in the sidebar. If you want to receive my new posts via email, sign up and they will be sent to you automatically. I have 25 more hours to log in on Satu, the tiger at the Houston Zoo. This means I have a total of 69 hours into the project at this time. I have really only been able to work on this piece on the weekends, and then only a few hours here and there. I hope once summer hits, I will be able to sit down and get him completed. One of the troubles is that I have run out of my dark wools, so I need to spend a couple of days dyeing. I have found this to be the case with most of my projects. I run out of my darkest darks before any other value. I assume that this means that we need a majority of dark to pop out the occasional light and anchor the medium values. There is nothing to report in terms of new things I have learned yet. I did find that I was using too dull of colors in the oranges on the top of the head, so I had to go back in with some brighter orange wools here and there. That seems to have fixed the problem.